Handling demands with a quality product known for being an industry leader. 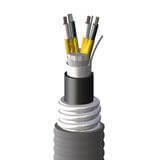 Part of Shawcor's Connection Systems group, ShawFlex instrumentation cable was built for industrial application—a key market in which we continue to specialize. Shawcor offers the broadest range of all shielding options, with high pair/triad count. Instrumentation cable is widely used in almost every industrial manufacturing and processing application, from petrochemical plants, water and waste water treatment plants, chemical processing facilities, food and beverage facilities, and general industrial control systems. Shawcor offers a larger variety of instrumentation cable, including both armored and unarmored tray cables, with all standard industry shielding options and a wide range of pair/triad counts. The cable quality and reliable performance have built our reputation in the field and earned the trust of many industrial customers.